A pencil that grows! When the Sprout Colour Pencil has served it's function, it can be planted and give life to a plant. The Sprout Pencil has been given this dual function by replacing the eraser, which usually sits on top of the Sprout Pencil, with a special seed capsule. The Sprout Colour Pencil is non-toxic, absolutely no lead. Made of natural sustainable materials: the body is cedar wood, the writing material is graphite and clay. The seed capsule, which contains high quality, Non-GMO European seeds, is water soluble, making the pencil easy to plant after use. Out of the pencil grow delicious fresh herbs, crispy vegetables or edible flowers. When the Sprout Colour Pencil has become too short to write with, it is ready to be planted. Follow the simple instructions below and see your Sprout Colour Pencil sprout. 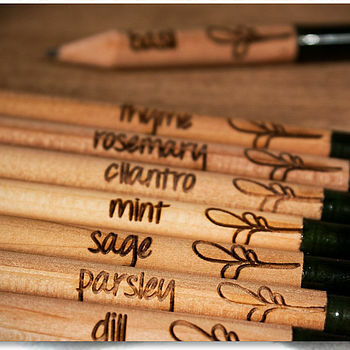 The seeds for the pencils have been chosen with great care, and they sprout quickly: i.e. within 1-3 weeks, depending on the seed variety. Most plants can be grown both indoors and outdoors. - Plant your Sprout pencils at a slight angle, so the capsule is just barely covered by a thin layer of soil. - Most of the seeds are quite little, so if you plant them too deeply, there is a chance that they will not sprout. - Water regularly, so the soil is always slightly damp. - If you water in a saucer, you can pour off the excess water after 10-15 minutes, so you do not drown the plants. - If the weather is very warm, it is best to water in the morning or evening.